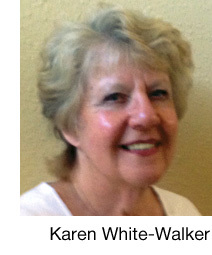 Karen White-Walker has been writing and was published since she's been 14 years old. Now sixty-something she's delighted that readers still think she has something to say. She's the wife of one, a mother of four, a teacher of thousands, a playwright of eight produced plays, and a writer of over 300 articles.